You can easily create your own playlists with the Music app to put tracks from various sources into collections of your choosing. Everybody loves playlists. They let you compile your very own music mix to match your mood or the occasion. Tap the Playlists button at the bottom of the iPad screen. In the dialog that appears, enter a name for the playlist and tap Save. In the list of selections that appears (see the figure), tap the plus sign next to each item you want to include. 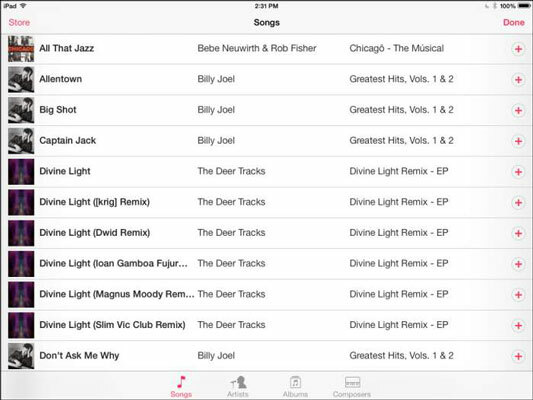 Your playlist appears in the Library list, and you can play it by tapping the list name and then the Play button. You can use the Genius Playlist feature in iTunes Store to set up playlists of recommended content in your Music library. Based on items you’ve purchased, iTunes Store suggests other purchases that would go well with your collection. Okay, it’s a way to get you to buy more music, but if you’re building your music collection, it might be worth a try! Visit the iTunes site for more information. To delete a song from the playlist, swipe left to right across the name of the song you want to delete and then tap the Delete button.